A stunning, heart-pounding, journey into the lost world of the Pharaohs. Wilbur Smith has earned international acclaim for his bestselling River God, The Seventh Scroll, and Warlock. Now, the unrivaled master of adventure returns with the eagerly awaited sequel to his thrilling Egyptian series with his most fantastic story yet. The Quest continues the story of the Warlock, Taita, wise in the lore of the gods and a master of magic and the supernatural. Egypt has been struck by a series of terrible plagues, killing its crops and crippling its people. Then the ultimate disaster befalls the kingdom. The Nile fails. The waters that nourish and sustain the land dry up. Something catastrophic is taking place in the distant and totally unexplored depths of Africa, from where the mighty river springs. In desperation the Pharaoh sends Taita, the only man who might be able to find his way through the hazardous territory to the source of the Nile and discover the cause of all their woes. But not even Taita can have any idea of what a terrible enemy waits in ambush in those dark lands at the end of their world. 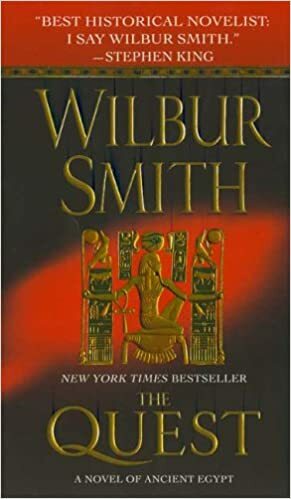 No other author can conjure up the violence and mystery of Ancient Egypt like Wilbur Smith. The Quest marks his stirring return to the acclaimed series and proves once again why fans such as Stephen King praise him as the world's "best historical novelist."